This week we are so excited to share with you some sneak peeks at one of our newest releases for CHA called "Dreamscape"! Dreamscape is a great new paper line from Quick Quotes and it gets even better when used with Spellbinder Dies! I wanted to make a shaped card and it is a super easy thing to do with the Grand Calibur and Labels Eight die set. I folded a 12’ long piece of paper and placed it on the largest Labels Eight die so that the fold was just below one end of the die (so that the fold is not cut when the rest of the paper is). I then used the die that is slightly smaller to cut the plaid paper. 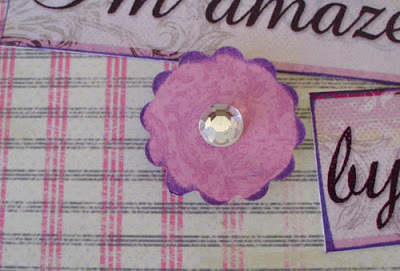 The flowers are actually a Creative Page Tab Die by Donna Salazar for Spellbinders that I cut in half (Rather than fold in half) and then I added a piece of bling to the middle of the flowers. The sentiment is part of the new line as well and all of the papers have been inked with the Purple Passion Powderpuff Ink Pad. Of course I couldn't stop with just one card so I made a Second Card. For this shaped card, I used the Reverse Wonky Rectangle Die Set to cut the card using the same process mentioned before (placing the fold slightly lower than one end of the die). I Used a smaller wonky rectangle die with the patterned paper. 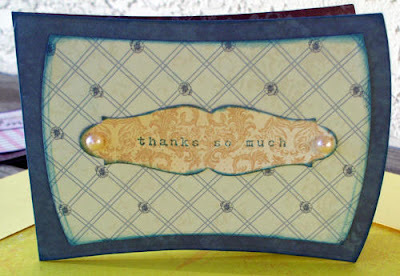 The Sentiment is stamped (using a My Mind’s Eye Stamp) with the Blue Moon Powderpuff Ink pad and is on a Grommet Tag that I cut using the Spellbinders Grommet Tags Set. I added pearls that were included in December’s Monthly kit. Hi everyone! I hope you are enjoying the start to 2012. 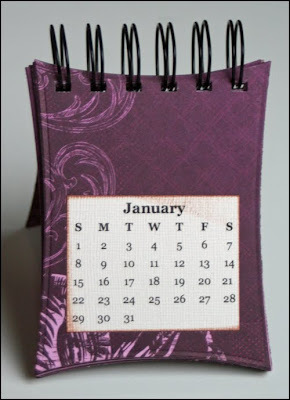 I for one am always trying to organize in January so I thought I would share how to make this cute little flip desk calendar. 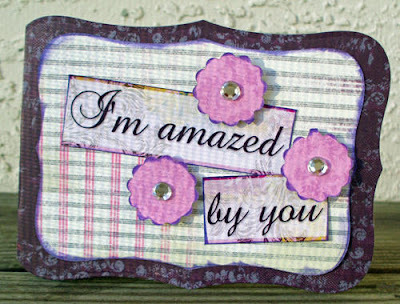 I used the new "Dreamscape" collection from Quick Quotes that is being released at CHA and Spellbinders Wonky Rectangle Dies. 1. 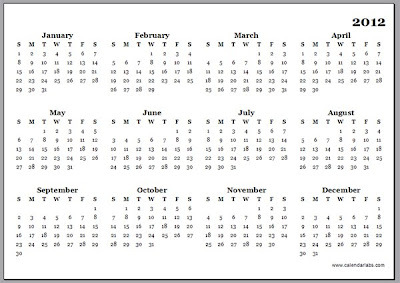 Print or stamp a set of mini monthly calendars. I printed mine from calendarlabs.com. They were free and the perfect size. 2. Cut and ink the edge of each month with Mocha Mama powderpuff ink. 3. Cut 15 of the largest die from Spellbinders Wonky Rectangle die. 11 of these will be for the inside pages, and the other 4 will be used for the front and back of each of the covers. I used Dreamscape papers 100 and 300. 4. 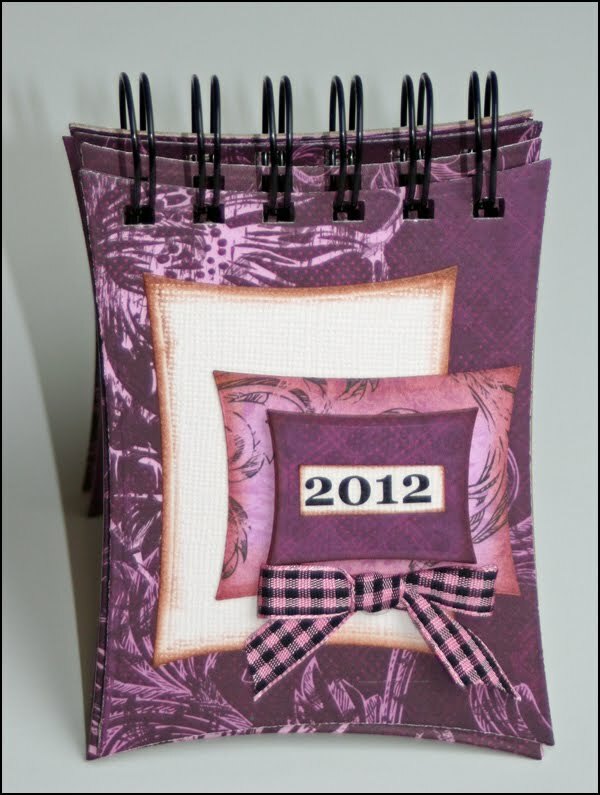 Using the largest rectangle die again and chipboard cut the front and back covers of the mini calendar. 5. 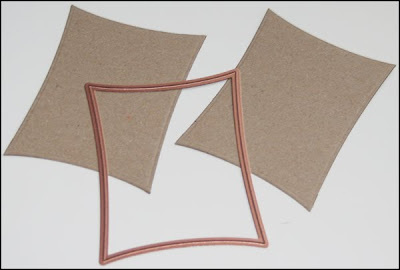 Adhere the pattern paper rectangles to the front and back of each chipboard piece using Beacon's 3 in 1 glue. 6. For the cover, cut the 3rd to largest rectangle die. I used cream cardstock for this. Ink the edges with Mocha Mama ink. 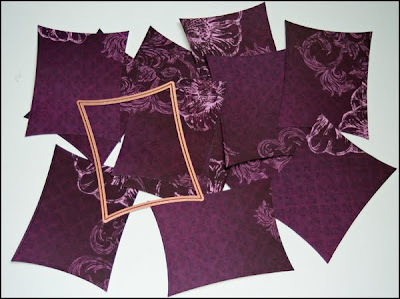 Then cut the 3rd and 2nd smallest rectangles using Dreamscape papers. I used the 100 and 300. Adhere the 3rd largest and 3rd smallest rectangle as shown in the picture. Ink around the "2012" label and adhere this to the smallest rectangle. Add a pop dot to the back of this so it is raised a bit. Tie a bow using Quick Quotes pink and black gingham ribbon and adhere below the "2012" title. 7. Bind the pages and covers together using a Bind-It-All. If you do not have one of these, you can simply punch holes and add a ring to keep them together. Here is a picture of one of the inside pages. Hope you have enjoyed this post! Have a fabulous day! Leave a comment today to get in on the New Year swag giveaway! Today is the final day! Check out all the details at this post!!! I love the colors! The calendar is beautiful. What a great calendar idea! Michelle's cards are so cute and I totally love the desk calendar idea. I'm going to have to scraplift that one! Thanks. Your calendar is Awesome!! I love the new paper and the terroific dies that you used! Great job!! Thank You for sharing the tutorial and always inspiring!! 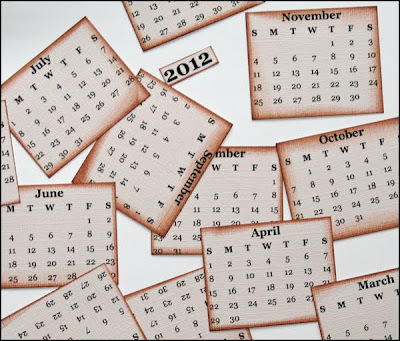 Wow, love this calender idea! Perfect size for any desk! Thanks for the new idea!